Senator Elizabeth Warren and VIce President Joe Biden listened to remarks at the dedication ceremony for the Edward M. Kennedy Institute for the United States Senate on March 30. 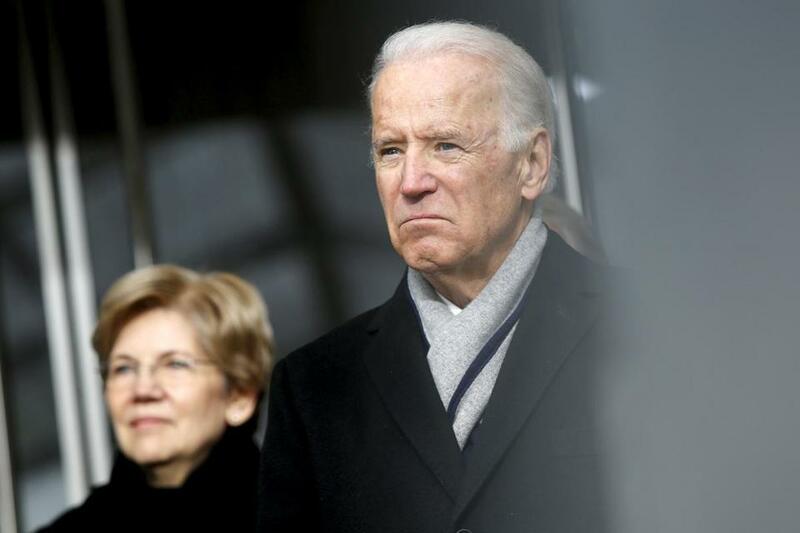 WASHINGTON — As Joe Biden mulls a presidential run, he’s aiming his legendary charm squarely at Senator Elizabeth Warren of Massachusetts. For it to work, he must overcome an awkward history between the two. A look at the public record shows that clashes between the pair began more than a decade ago. The fraught relationship has improved in recent years, but their past would complicate a potential alliance should he decide to run for president — and, as some have speculated, ask her to join him on a ticket. Biden was an early opponent of Warren as she cut her teeth in national politics, and he became one of the first in a long list of Democrats to be called out by her for not sufficiently supporting the pro-middle class policies that she has made a reputation promoting. There’s the lengthy letter she penned in 2002 to The New York Times. In the missive she accused him of taking a position that made it harder for women to overcome debt and suggested a reason why: His home state is a place “where many banks and credit-card issuers are incorporated,” she wrote. Three years later they were still at it, continuing to debate on consumer debt, with Biden accusing her in 2005 of making a “mildly demagogic” argument as a witness before his Judiciary committee. The rationale for Biden to skip Iowa and New Hampshire is this: He would enter in the race too late to compete in those states. Biden didn’t dissent from the West Wing views, publicly at least. And their one-on-one Saturday lunch at the US Naval Observatory was Warren’s first solo meal with the vice president and her first trip to the vice president’s official residence, according to a person familiar with the meeting. “I’ve never heard of much of a relationship between them,” said Barney Frank, the former Massachusetts representative who worked with Warren on legislation to regulate large financial institutions in the wake of the 2008 recession. Biden and Warren never overlapped in the Senate. Biden, who was in the midst of his own reelection campaign, didn’t help Warren in her 2012 Senate bid. Biden and Warren both declined to comment for this story via their representatives. Support from Warren in 2016 — or even a joint ticket, as some have speculated — offers Biden some clear advantages. He has long painted himself as a man fighting for the middle class. A nod from Warren, a person who has accused him of siding with business interests against middle-class families loaded down with credit card debt, could help ease a suspicious base. It’s less clear how a Biden-Warren team would benefit Warren. She decided not to seek the White House herself, and has been sought out for advice by all of the major Democratic candidates. Warren’s public clashes with Biden, which go back more than a decade, were centered on a massive overhaul to the country’s bankruptcy laws that was debated in Congress for years. The banking and credit card industry wanted to make it more difficult for consumers to declare bankruptcy and therefore easier for them to continue to collect debts. Warren, then a Harvard law professor known for her work studying bankruptcy, argued that consumers shouldn’t face new hurdles. The legislation put Biden in a delicate spot; many of the largest Delaware employers, including credit card giant MBNA, were headquartered in his home state. When he supported an industry version of the bill, some liberal bloggers called him the “Senator from MBNA,” according to news accounts from the time. In her 844-word letter to The New York Times published in May 2002, Warren equated Biden’s support of the bill to a stance against women since they disproportionately file for bankruptcy protection. In a February 2005 Judiciary Committee hearing on a different version of the bill, Biden spent much of his allotted time sparring with Warren, fighting about topics that included the particularities of Delaware’s chancery court, society’s role in shouldering the costs of bankruptcy, and the interest rates that credit cards were permitted to charge. “Your problem with credit card companies is usury rates. . . . 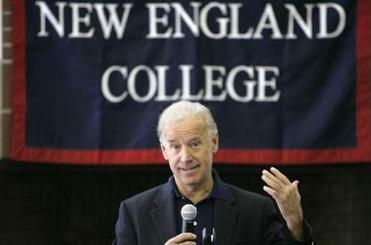 It is not about the bankruptcy bill,” Biden said to Warren, who was at the witness table. “Senator, if you are not going to fix that problem, you can’t take away the last shred of protection from these families,” Warren replied. Despite their uneven history, Biden and Warren do have some allies in common. When Biden became vice president, his chief of staff, Ted Kaufman, replaced him in the Senate — and took a tough stance on financial institutions during the negotiations on the battle to pass the Dodd-Frank financial regulatory overhaul. It was a view similar to Warren’s, and because Kaufman’s actions were widely viewed as being done with the blessing of the vice president, they helped improve Biden’s standing among Warren’s backers. Then in 2010 Kaufman took over Warren’s job as the head of the Congressional Oversight Panel, a committee created to keep a close eye on hundreds of billions of dollars being funneled through the Troubled Asset Relief Program. In that role, too, his views and attitudes were similar to Warren’s. Kaufman didn’t reply to requests for comment. Also, there was Biden’s late son, Beau, who died of brain cancer in May. As Delaware’s attorney general, he played an aggressive role forcing mortgage lenders to pay tens of millions of dollars to his state for misleading investors about risk prior to the financial crisis. But Warren and Biden’s paths have only occasionally crossed in public. They gave back-to-back addresses to the Netroots Nation conference in Detroit in 2014. Last March, they stood next to each other, clad in dark winter overcoats, listening to the Boston Children’s chorus at the dedication ceremony for the Edward M. Kennedy Institute for the United States Senate. And Biden spoke just after Warren at a service for MIT police officer Sean Collier, who was killed by the Tsarnaev brothers, who also bombed the Boston Marathon days before. Before he gave his eulogy, Biden planted a kiss on Warren’s cheek and acknowledged her remarks. “Elizabeth, that was beautiful,” he said.